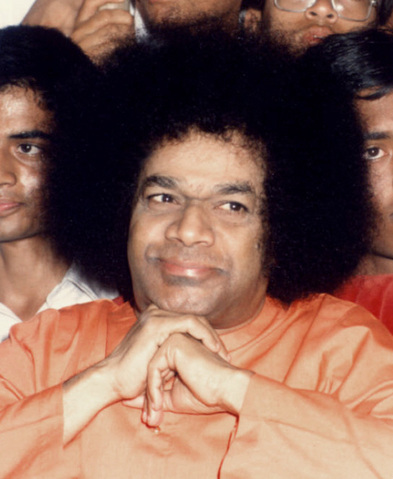 Sai Baba Miracles - "How's the bullet, Ronald?" Sai Baba is omnipresent, omniscient and omnipotent. Event after event that have happened in the lifetime of Sri Sathya Sai Baba have proved that beyond doubt. One such incident that did just that occurred in South Africa. Mr. Ronald has been a devotee of Swami foe last 6/7 years. He stays in South Africa and keeps coming to Parthy often. Once on such a trip, Ronald came to have Baba's darshan at Brindavan. After darshan, Ronald went straight to the cabin of Mr. Narasimhamoorthy, the warden of Brindavan campus of Sri Satya Sai Institute Of Higher Learning and asked for Vibhuti (sacred ash), which many have seen Baba give to people who assemble for His darshan everyday both morning and evening. Seemingly a common request by Ronald, Sri Narasimhamoorthy picked up two small packets of Vibhuti and handed them over to Ronald. Ronald accepted them and was expected to leave the office premises; at least that is what the warden would have expected Ronald to do and continued looking through the papers that had been placed before him for his guidance or approval. "Sir, I need Vibhuti to take back to my home in South Africa" asked Ronald. Looking up to him, the warden said, " That's what was given to you Ronald" pointing to the Vibhuti packets in his hand. " But sir that's not enough" replied Ronald "I want Vibhuti to shipped in a 10-tonne container to South Africa." Surprised at such an answer from Ronald, the warden sir enquired about the reason for such a peculiar request form him. Ronald narrated his story, which stunned the warden and rendered him speechless. Ronald stays in Natal province of South Africa, a province that is notorious for anti-social activities. It was a rainy night at Natal, when Ronald heard a knock at his door. Ronald enquired as to who it could be. They replied "Pedestrians sir. It's raining cats and dogs. Please allow us to stay in your place for the night." Not doubting for an instant, Ronald opened the door. As Ronald opened the door, the so-called pedestrians opened fire and shot him at point blank range. Once in to his house, they ran amok collecting all that they could in his house and ran out shutting the door, leaving Ronald in a pool of blood. Ronald lay in semi-conscious state, looking at SAI BABA's photograph and called out, in pain, to Swami from within. As he cried out, the large photograph of Baba towards which he was looking seemed to move and as his call became even more fervent, the movement became even more vigorous. As the photo shook vigorously, Ronald found SAI BABA coming out of the photograph and walked the space unto his wounded body. As He reached Ronald's wounded body, Baba waved his hand and manifested huge amount of Vibhuti (sacred ash) and Himself applied it on Ronald's body near liver region. Baba then told him " Worry not, Ronald, for I shall take care of your wound. The bullet is embedded in a small corner near the liver. I have given you prasadam (divine and potent medicine in form of sacred ash. You need not undergo any operation. That bullet shall get automatically dissolved." As Ronald finished narrating, he showed the warden an x-ray of his abdomen - liver area, which clearly showed the 9-inch bullet resting in the area. "This, sir" continued Ronald "has been in my body for the last 3 months. Only difference being that it was 9-inches long then, now it has been dissolved to mere 3 and 1/2 inches. The rest too will dissolve." Ronald's experience became the talking point among the people, who had assembled at Baba's ashram. Many wanted to question him in person; many even had a look at the x-ray film.... Strange are Baba's ways of responding to those who call on him. Ever heard of a person living, without even a slightest amount of difficulty, with a 9-inch steel-rolled plate inside his body for 3 months? Well, as far as we could remember... 'Never'. Next day too people were discussing this till Baba arrived to give darshan. As usual, Baba started from the ladies side, went to the children and then to the men's side. As HE crossed over, His ever suddenly fell on Ronald. HE immediately went towards him and gave him HIS hand. Ronald stood up; Baba placed HIS hand at Ronald's abdomen and enquired, " Hello Ronal, How is the bullet". "Swami", replied Ronald, "by your grace, its dissolved 5 ? inches in 3 months." "The rest 3 ? inches" continued Swami "too, will dissolve in next 2 months". Having said that, He materialized Vibhuti and Himself put it into Ronald's mouth, patted him, calling him "Good boy ... good boy". Ronald returned back in full bliss to South Africa. Two months later, the warden sir received a parcel for Natal, bearing the name of Ronald as its sender. Inside it was a letter from Ronald accompanied by a fresh x-ray of his abdominal region. The bullet was nowhere to be seen, it had been dissolved.